Learning the truth of what happened to Krypton, Kara must separate fact and fiction and believe in herself! And after teaming up with Power Boy to stop a hurricane in Mexico, Dark Angel attacks the Girl of Steel! Then, Kara accidentally wrecks Air Force One, only to hide out at the Kents' home in Kansas. 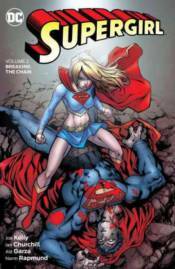 Collects SUPERGIRL #11, #13-22 and a story from the DC UNIVERSE INFINITE CRISIS CHRISTMAS SPECIAL #1.